If you want to save money and increase your wealth, probably one of the best places to begin is to see where you can reduce your taxes. No one likes paying what we think of as more taxes than we should, but very few people focus their efforts on minimizing the taxes they pay. Most people are not well-versed in tax law. So, it does not hurt to have someone who prepares your taxes who is knowledgeable in this area. If you do not have a tax advisor now, it may be a good idea to find one before the tax season gets cranking up in full swing after the New Year. Just like networking for a new job, now is the time to start making connections before you need them. Now is the time to start looking for a tax advisor. Part of planning a budget, investing, and spending your money also includes making financial decisions that benefit you from a tax standpoint. Ignoring tax implications on your investments and income can have a high cost when it comes time to file your taxes early next year. Review how much of your current salary is paid towards taxes. Do you receive a huge tax refund every year? You may need to make changes to your W-4 tax withholding form? You can adjust your withholding by submitting a new W-4 to your company’s HR or payroll department and update your number of exemptions. Using these benefits will lower your overall taxable income which will lower the amount of taxes that you pay. If you earn $60,000 per year before taxes and contribute $500 per month in a 401k retirement plan, the government considers you to have subsequently earned only $54,000 for the year. You can see that if you’re employed at a company that offers any of the above benefits why it’s prudent to take the money you earn and apply it accordingly. 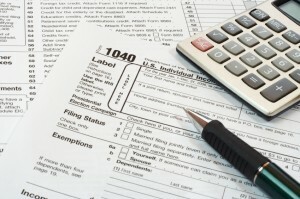 Tax credits also are helpful when it comes to reducing your tax bill. Therefore, make sure that you take all the deductibles and credits that are allowed. This is where hiring a tax professional can sometimes pay for itself. Tax credits can include education credits, credits for investing towards retirement, child credit, earned income tax credit, credit for purchasing a hybrid vehicle, and many others. You may choose is to accelerate your deductions in a certain tax year by paying obligations that are tax-deductible before they come due in the following year. A good example of accelerating your deductions is paying your property tax bill ahead of schedule, or before it is due date in the next year. That way, you can benefit and increase the amount of your tax deduction in the current year. Now is the time of the year that you need to reevaluate your tax liabilities and where you stand. Do you need to make any changes? Now is the perfect time to make them. You can change the last seven months of the year and the tax liabilities that you have incurred, but with careful planning, you can save some money over the next few months before the end of the year gets here. It will be upon us before you realize it, and then it will be too late to change your taxes. Disclaimer – I am not a tax lawyer or a Certified Public Accountant (CPA). You should discuss your specific tax questions and situations with a professional before making any decisions or taking any action. Previous post: When is the Best Time To Refinance Your Home?